These are lovely for children's activities - practical and colourful. Create an environment where their imagination can go wild without damaging your furniture with our Splash Mats. Available in 4 bright and captivating designs, these large coveralls can be spread over tables and desks to offer a barrier against paints, glues and other crafts. 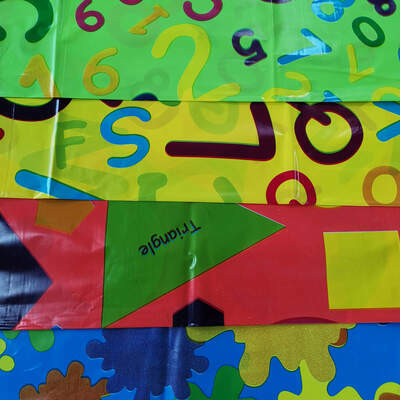 The impermeable material used is entirely reliable for repeated use while the bright colours and curriculum linked designs promise to draw in young artists and spark their creativity. Each of these splash mats has a large dimension that will protect a wide area and has a versatility that lends itself to a range of tasks. Dimensions: 1000m x 1500mm (covers 1.5 sqm). Here at Gompels, we are proud to support the creativity of all our clients. From our Jumbo Easy Grip Paint Brushes through to our Gompels Small Aprons Flat Pack and Paint Sticks Assorted, you'll find everything you need to create Art sessions that everyone loves.